Some of you may wonder where Linda and I put all the crap (oops, I mean lovely things) we buy in Mexico. The purpose of this blog entry is to show where these things are in the context of our home. This is a view of the kitchen looking through the dining room. and above the doorway is a sign which actually is not from Mexico, but was made by Patti Tapper, an artist friend (www.web.mac.com\pattitapper), as a gift to us. you will see a mexican mirror. not technically purchased in Mexico, this is a plate that Linda designed and had produced in Dolores Hidalgo, a city not far from San Miguel which is known for its pottery. and a Michoacan pineapple vase. a prizewinning vase purchased at the Uruapan crafts fair. It is inlaid with silver! and an interesting shaped Michoacan water bottle. two vases from Michoacan, purchased from local craftspeople (see earlier blog). The vase on the left is in the shape of a pumpkin. 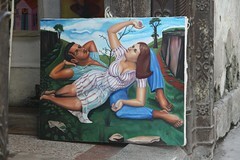 A painting by an American (Josh Klingerman) living in San Miguel. Interesting note: the piece was framed in the local prison for about $12. One of the services prisoners provide for extra spending money. In Mexican prisons, they don't waste public money on things like toilet paper, I am told. Adam and Eve are actually from Guatemala, but that's close enough for this blog. And a lovely Santos (saint) from a private chapel near Mexico city. This is probably Saint Michael (San Miguel), even though it looks feminine. 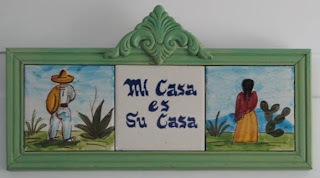 On the shelving in the living room are some (a fraction) of our Michoacan plates and vases. Note the unusual white color of the two vases. These two chairs in the living room are made in San Miguel and shipped to Michigan. Note the green Michoacan vase between them on the floor. Many of you have already seen these paintings purchased off the wall of a restaurant in Merida. They were at some time the menu! is a molcajete - essentially a mortar and pestle. is a wooden mold used for making sugar. I can't swear that I haven't missed a few things. In fact, it's highly probable. Although Linda and I are back in Michigan, from time to time I will post a blog entry from Mexico. Today's entry concerns "Charales". No, this is not a typo of my name. It's a small fish (anchovy, whitebait or herring-like fish - http://www.spanishdict.com/translate/boqueron) fried and eaten whole. I believe they come from Lake Patzcuaro in Michoacan. In any case, that's where I first sampled them. Usually are just eaten salted. However, this batch, bought at the supermarket in San Miguel just before we left town, is dusted with chile powder. Note that they are called "boqueron" on the package, rather than "charales". I don't have a clue as to why. Also note the price - about $9 for 2.2 lbs. This package contained about 0.7 lb. for about $2.25. I smuggled them across the US border. Had I declared them, I might have been jailed in Guantanamo! These little suckers are good! You can't eat just one (at least I can't). Most of my family and friends, however, have not found it difficult to refuse even a taste.